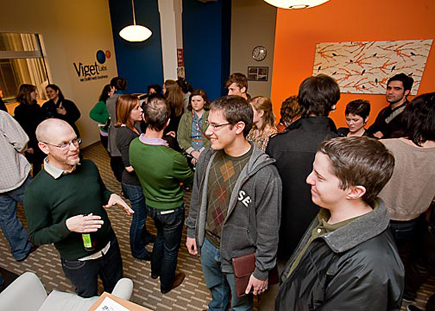 Viget's Durham office was recently invited to participate in the AIGA Studio Open House event. Along with eight other studios in Durham and Carrboro, we opened our doors to network with the local design community, and show off our space. With slideshows of our work running and refreshments in place, we were ready for the crowds to come. And wow, did they ever come. We estimated that a total of 300-400 people walked through the office during the entire three hour event. A graduate student in the midst of changing careers was interested in Viget's work/life balance compared to many agencies. We talked about how hard it is to find the right agency fit when you're older and have more responsibilities. This is one of the things that makes Viget a great place to work, and it's nice that people recognize that. A group of East Carolina University students asked questions about how relevant their typography classes are to web design. This was a perfect opportunity to tell them about web fonts and responsive design. They left feeling stoked about the web, and that felt awesome. A children's book publisher came from Chapel Hill to talk with us and learn more about the design industry in the area. We talked to a photographer/filmmaker who used the experience to show his 9-year-old daughter, an aspiring illustrator, that there are lots of designers doing great work in the Triangle. By the time that we were done talking, she was sketching out her latest masterpiece on our whiteboard. We had an opportunity to answer some great questions from several Meredith College art students who were curious about our design process, and the extent to which a background in print design might help or hinder a career in web design. Viget has been developing a relationship with NC State's School of Design over the past few years. We were finally able to make a face-to-face connection with one of the design professors, and she filled us in on her sense of what current students are looking for after graduation. We owe a big thanks to AIGA for asking us to be a part of the open house festivities. Another Studio Open House will be help in Raleigh/Cary from 5:30-8:30pm on Thursday, March 10, 2011. Mark it on your calendar and get out to see Capstrat, Creative Associates, Fabrik Agency, Fragment Labs, FWV, Hesketh, Mellonaid Creative, New Kind, Ninth Floor, Red Hat, R+M, and Signal Design. Watch the AIGA Raleigh website for more information.